Story: A walking plague on humanity, Hel, The Avatar of Death. The third of the four Sects from the Cult of Ragnarok, The Hel Sect believe that the world will end by a powerful plague that wipes out all life, giving those that survive a new world to rebuild. With that ideaology, The Hel Sect dedicate themselves to unleashing various diseases amongst populated areas or creating their own biological weapon cocktails. Their Avatar, Hel, is capable of making an individual sick or die with just a touch, called "Hel's Blessing." She oversees any biological outbreak operation and was responsible for the viral scare after making a raid at the CDC (The Center for Disease Control) on a day called "Black Tuesday" due to the deaths of over 500 people and 10,00 infected with diseases thought to be long extinct. Her withering touch is due to possessing fragments of the Philosopher's Stone; which makes her and the Hel Sect a target of the Alchemist and the Dee Agents. Abilities: Hel's gloves contain shards of the Philosopher's Stone. With the stones, Hel can manipulate the biological and genetic compounds within the air to generate and cultivate diseases. Making such a virulant compound allows her to infect and poison people with a touch ,hence the term "Hel's Blessing." Her touch is also capable of manipulating the biological composition within an individual's body to grow tumors, sores, and various other diseases. She is also capable of affecting inorganic materials as she merely withers any object she desires. 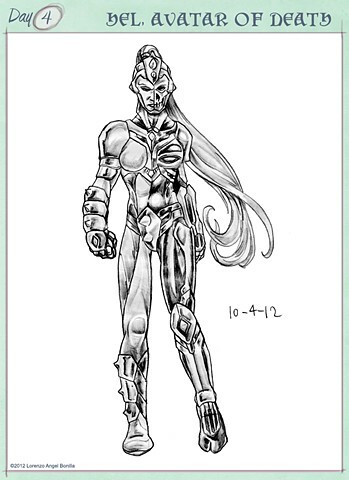 The Hel Avatar is wearing an airtight suit that acts as both armor and containment to prevent her from getting infected with her own compounds and many believe that the stones may enable to have her immune to her diseases by synthesizing the antibodies for the various diseases. The lengthy ponytail is actually an accessory and not necessarily her natural hair as it has shown on a few incidents of coming off during pursuit. As for fighting style, she is fairly limited as her touch alone kills any who comes near her, as well as dispersing any airborne pathogens. When in battle, she usually flees after unleashing a biological attack and most heroes and Agents rely on ranged attacks to defeat her. Inception: One of my more recent ideas. I went with the half/half design based on Hel being a normal woman on one side, and a withered corpse on the other. With the helmet design, pauldrons and codpiece from Jaguara of Wolf's Rain. Her ponytail is a last minute addition as I felt it needed something flowing off of her that wasn't a gown or cape.